If you’ve ever liked the NY Dolls, go out and get this DVD today. I picked it up last week, and thoroughly rocked out to it this weekend. 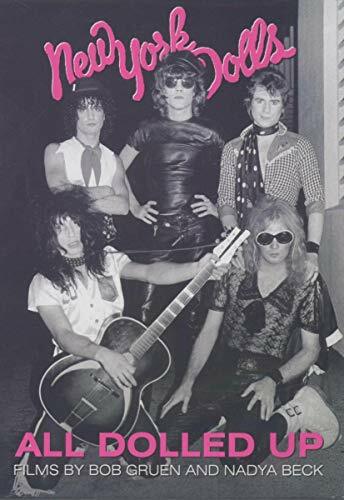 All Dolled Up is a B/W documentary of the New York Dolls during their heady days of Fall ’73. All footage was shot by famed rock photographer Bob Gruen and his wife Nadya. The Dolls had just released their debut LP, and were playing NYC shows, and heading to LA to play Whiskey-a-Go-Go and do some TV appearances. Gruen and his wife just let their cinema verite f-l-y and this doc catches the Dolls in all the heady exuberance of being a young band on the rise. David Johansen is charming and funny, and Johnny Thunders, despite his eventual drugfall, is a corker rockin’ guitarist. Absolutely great stuff. My Dolls kick is in high gear – hear my Dolls tribute song “Too Much Too Soon” at my MySpace and Soundclick sites.